Termites are dangerous creatures. Yes, that’s right! They wreak havoc in your home by devouring the very material used to build it; wood! It is better to get rid of these wood-eating creatures quickly. Otherwise, they will shake the very foundations of your home, literally! You can get rid of termites through natural or chemical means. Which method you choose is entirely up to you and dependent on the severity of the infestation. You can use different methods to get rid of termites naturally. Following are some methods you can apply. You can use beneficial nematodes to chase the termites out of your home. What are these creatures, you might ask? These are unsegmented worms, which kill off garden pests, like termites. How do these creatures achieve this feat? The answer is by burrowing into their hosts and thereby, killing them. Getting your hands on these useful worms is not an issue. They can be bought at any garden store. The main thing to remember is to use these nematodes the moment they are bought. If left outside for long, their effectiveness will waver. However, if you choose to delay using them then keep them in the refrigerator. Sunlight will harm them, so it is best to keep them far away from it. When you are ready to use them, place them in your garden, before sunrise. Using a cardboard trap is one of the most effective ways to get rid of termites. 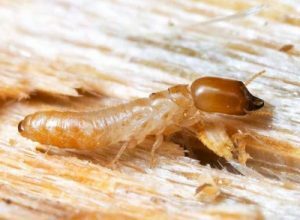 Termites are attracted to cellulose, and cardboard is chock full of it. When setting the trap, spray the cardboard with cellulose spray, or any other spray, which brings out the scent of the cellulose. Take the cardboard and place it near an area, which is heavily infested with termites. The scent of the cellulose will attract and compel them to leave their hiding place. Once they have entered the cardboard trap, close it off and burn it right away. Intense heat kills termites. The best way to accomplish this feat naturally is, exposing the termites to sunlight. The heat that comes with it will kill them. Place your furniture, which is infested with termites, under scorching sunlight. Then wait for the sun’s rays to handle the matter for you. 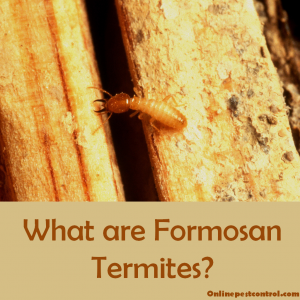 Termites survive on moisture. Get rid of puddles, damp wood, mulch, or any damp item, in your home. It might end up attracting swarms of termites. Doing this would also expose the remaining termites to sunlight, which would take care of the problem immediately. In many of the termite insecticides available in the market, you will find one common ingredient. What might that ingredient be? It is none other than Boric acid. The effect of Boric acid is instantaneous. It dehydrates them and shuts down their nervous system. Spray infested wood with Boric acid and wait for the effect to take place. Spray it on strategic places; those, which you think, might contain termite colonies. Alternatively, you can use heat fumigation, to get rid of them as well. As mentioned previously, when termites are exposed to high heat, they cannot survive. When using this method, it is better to avail the services of a professional, as they are better equipped for this method. Arsenic dust is an effective chemical for getting rid of termites even when one termite is exposed to this insecticide, the whole colony can be wiped out overnight. How? You might wonder. The insecticide will transmit to other termites in the colony and little by little, kill off the entire colony. Finally, instead of doing all the hard work yourself you can hire a professional service to take care of the matter for you. Pest control will rid your home of termites in no time at all. You can come back to a home that is free of these wood munchers. What more could you ask for?